From backyard boat ramp to AK tent camp, Simms' G4 Pro® wader is "lived in" by more professional guides than all others combined. About the G4 Pro™ Stockingfoot Why GORE-TEX®? Wore my last pair of G4's out..... after 5 rigorous years of wading hard in Montana. Didn't think twice about buying a new pair because I know they will last me as long. I Have tried just about every other pair on the market and will never own a different brand's wader. 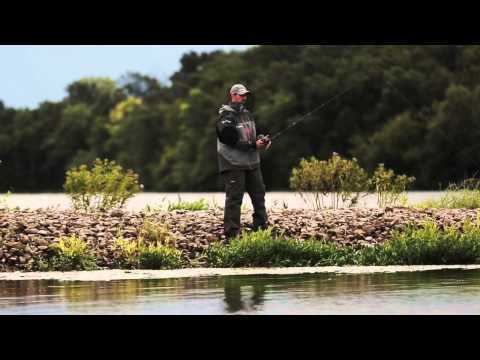 Their built tough, and Simms stands behind their product. Customer Service is top notch. Best Waders On The Market Hands Down! Being a guide in Alaska and Patagonia, I am forced to buy new ones since my 8 year waders got stolen, without a lick. The best you can get. I replaced my 1999 Simms Goretex waders, which I absolutely LOVED and still miss, with a pair G4s right before a Henry's Fork trip last year. Since then I've probably fished them forty days, many of those days were pretty rough. They are extremely comfortable in hot and cold weather. I wish the belt loops were an inch or two higher, but other than that there is nothing else I would change. I should also note that being short and fat (5'11" with a 29 inch inseam and 225) it was great to order exactly the right size wader set up for a normal sized foot. I hope to get 20 years out of these, just like their predecessors. I've fished the G4Zs hard for 4 seasons now and I love them! I couldn't imagine wearing another wader. My ONLY complaint is that they don't come in my size (MKS). This pair is LS which is the closest fitting size and they are too baggy in the legs. It's time to order a new pair and I cant decide if its worth giving up THE BEST WADERS on the market for the better fitting G3s. SIMMS!!!! Please make these in Medium King Short! My wife bought me the G4 pro stocking foot wader for Christmas last year and I really love them. I fish year round here in Ma. My wife thinks I’m crazy I’ve been out in -3 degree weather flyfishing and stayed dry and warm by layering up. I had to send them back for a small leak in the prime time of the year between trout fishing and striper fishing this past July and the turn around time was fast! I’m 5’9” 160lbs I have the large regular I wish I would of got the large short my fault. I hope this doesn’t end up being a problem because of the length. I definitely recommend these waders! Had my G3s for about 10 years without a leak. Too bad I gave them to my buddy. Bought the G4s this summer and they're leaking within a month of first use, and not just in one place. I can't recall any harm/trauma/roughness that would have caused this, I've barely used them. Repairs and warranties are great but with a 3/4-week ship and repair time, I'm going without them for November, which actually means I'm SOL for fishing for November. Guess I should have tested them before the 30-day period but It was too hot this summer/fall to even need them. Now when I do need them, they don't work. I went fishing today and it was the most comfortable waders I ever wore. I am so glad I bought these. I can't wait to go again. ...These are the ones you want! Going on three years in my G4 Pros, they have kept me comfortable and dry all season lomng guiding in Maine, and beyond, Great Lakes, Alaskan, etc... Simply Bombproof! I recently purchased a pair of these, and I am more than satisfied. These waders are a godsend! After going through several pairs of cheap waders, I decided to save up and get these. They are worth every penny! They are extremely comfortable, and warm in the cold water, yet cool and breathable in the sun. They block the wind 100%! They fit great, and seem very durable given how light they are. The pockets keep my stuff completely dry and the gravel guards work better against the sand than any I have used on other waders. As a surf fisherman the breathability of these waders is priceless. Walking miles through sand and in the sun, its very easy to overheat, but not in these. They keep me very very comfortable in any weather. Ive gone through a couple of waders before decided to go over for a more high end pair of waders and then the G4 Pro was the obvious choice. At the first try they really felt solid and you could see and feel the quality of every stitch and seem. They really make you feel comfortable by the water and keeps you warm and dry by the river. The only downside with this model is the size-chart that leaves no room for a perfect fit at least for my body. A typical medium guy with a 31-32 inseam has to go around with too long legs and have a higher risk of leakage since the only choices for me is to go up or down 1 size since Medium/Short is to short and Regular Medium is to long. I have not yet begun to fish! I have not yet begun to fish! At least that's what I feel these waders are telling me. I picked these bad boys up late 2012, have over a hundred days on the water with them, and they have yet to have a problem. No leaks, no noticeable signs of wear. I am still totally dry! Not only are these great for fly fishing SW Colorado; I would also feel confident in taking these waders into battle in a bog or swamp against a pack of baby T-rexes. Take care of your waders, they will take care of you! You never know when you will be in the middle of a swamp, carnivores on your tail, warmth and comfort something that isn't even a problem thanks to the G4 Pros. These waders are tough! I'm in them every chance I get and the only damage has been in the gravel guards from a stick getting stuck and the rear belt loop started to Frey but I just nicked that with a lighter and it melted and stopped the frey! My only gripe is now they put those nifty shoulder straps on! Wish they would of done that from the beginning! Wow! Great set of waders have spent some serious time in these now and I have nothing but good to say. Very comfortable, you feel bulletproof ripping through the river in these things. Will buy another set in a second. I'm a big fan of all Simms gear. I have plenty and the coats and technical clothing rock... however.... I have been through 3 different waders in a year. I have the same problem with the g4, the g3, and the classic guides.... they all leak. I have sent all 3 back and they still leak. granted I am in waders 200+ days a year but still.... these things should be bomb proof for the price and they aren't. everywhere there is a seem I end up with random significant wet spots on my lower legs time in and time out. It's very frustrating. I love the features and they seem to be built well but the fact is they leak. Thanks for your feedback. Your waders shouldn't leak in less than a month. We do have a no questions asked 30 Day Wader Exchange Program. Also your first repair in the first year of ownership is covered by us. We have quick turnaround as our repair center is here in Bozeman Montana. Give us a call at 888.585.3570 or email us at info@simmsfishing.com so we can help you. I had over 700 days on my last pair of G4 waders, and I would bet my new pair will get just as many. Being a full time guide in the Great Smoky Mountains you punish gear and need waders that can withstand not only the elements, but you as well. My G4 waders do that with ease. I put my waders on at 6am everyday and many days wear them 14 hours or more. All day comfort, unrestricted movement, perfect fit, and most of all, superior durability. Simms waders are the best on the planet! I am a part time fly fishing guide and test gear for GORE. I tend to be hard on my gear and the Simms G4 Pro Stockingfoot Waders are simply fantastic. The 5-Layer GORE-TEX Pro Shell fabric in the legs and seat allow for aggressive bushwhacking to the river without at all impeding range of motion or causing overheating. The zippered hand warmer pockets are ideal for a quick thaw of cold hands and the waterproof zippers keep your phone or other valuables high and dry. My favorite feather of these waders is the flip-out Tippet Tender Pocket. It has enough room to store leader/tippet, indicators, floatant or whatever else you may need for a day on the river. The outside of the Velcro closures also works great for additional fly storage. Just put a few flies on the Velcro you'll need for the day and leave the fly box in the truck! There are too many features to list in a brief review, but the Simms G4 Pro Stockingfoot Waders are the toughest out there and worth every penny. With the tried and true GORE-TEX fabrics and the Simms design and exemplary customer service, you can go wrong! Im on the water 150+ days a year and I am very rough on my gear. these waders can handle everything that you throw at them. After 2 year they have no leaks, rips or anything like that. I recommend putting the extra $ to get high end waders! The G4 waders are dry, comfortable and a great tool for any Guide or fisherman. I put these waders through a very harsh salt water environment. They have never let me down. I spend close to two hundred days in my waders all over the world, and these are far and away my favorite wader. They are good and tough for those trips where they wont get hung out to dry every night. Just upgraded to the G4z for the upcoming year. hopefully they are as good as the G4pro. I have owned/tested different waders from various companies and the Simms G4's have been the best quality waders by far and away. The build quality of the G4 waders has lasted over 4 years with fishing over 60 days each year. This is incredible as I have never had a pair make it over 2 years previously (even with the patches). The G4 pair has never sprung a leak as well even in a few interactions with barb wire fences. The breathabilty of the GORTEX is incredible and makes the waders comfortable even in the summer although I do much of my fishing in the dead of winter. Many of the winter fishing trips I practically live in the waders and they take a beating. I am curious how many more years I can get out of them as GORETEX fabric and the neoprene booties have all held up. I test products for GORE and I am very impressed by the G4 Waders. I fish about 80 to 90 days a year and I can believe how versatile and comfortable these waders r . They have great features , they r build tough and they can take anything I throw at them , from fishing small streams in the summer to fishing for steelhead in the winter this is hands down the best wader on the planet . Thank u SIMMS for such a quality product !!! Just returned from Alaska where these were used pretty hard. Good fit, comfortable and so sturdy I was afraid they would cause a TSA inspection of my duffle bag at the airport in Anchorage. I would recommend these to anyone looking for a very tough, durable comfortable wader. I live in Wisconsin on the Mississippi River. I wear my Simms stocking foot waders for trout fishing Wisconsin, Iowa, Alaska and duck hunting and trapping. I switch to neoprene waders for winter trapping but continue wearing my Simms all winter for fishing the streams. I Am in my Simms waders at least 120 days a year. They last longer than the breathable waders my hunting buddy's buy every two years. 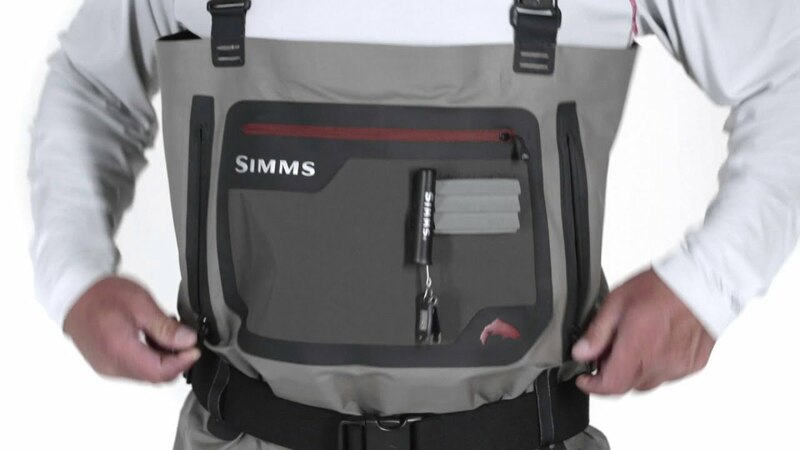 I can't say enough good things about Simms waders. 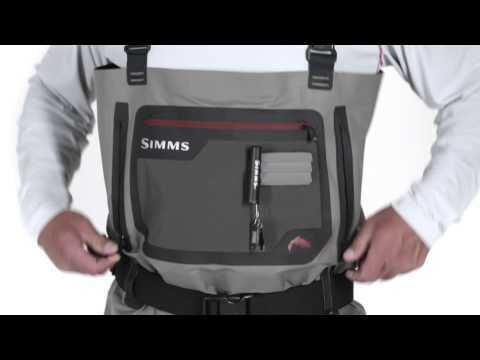 Simms waders are unmatched in the industry, hands down bar-none! I fish 100+ days a year, often hiking 5+ miles through forest, river bank and water with zero complaints about being waterproof, comfortable and stylin! I prefer the G3 & G4 series, yes they're more expensive, but they're worth it! Made in the USA (and made by Simms) makes all the difference! And no, I don't work for Simms, nor do I receive any endorsements for speaking to my experience with their products - I just fish a lot and love well made gear! I got this wader early October 2012 and used it about 15 days so far on the River and it is built so well, it is HIGHLY breathable, very durable, and the most comfortable wader I have ever worn. The new G4 is as good as it gets!